Limited time offer: save 20%! Limited time offer: save 25%! 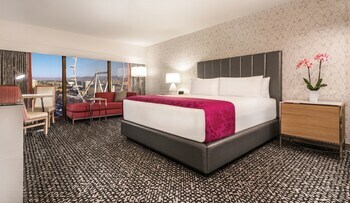 Stay 2 nights and get the 2nd night free! Limited time offer: save 30%! Limited time offer: save 10%! Limited time offer: save 15%! One of the highlights of any trip to Vegas is the daily trip to the buffets. 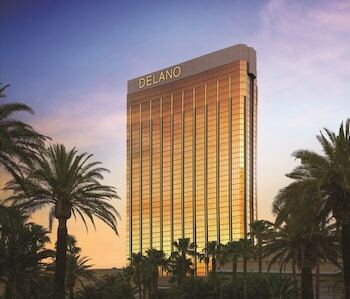 No place in the world has so many great buffets in one location. With so many tempting choices, finding the right one can be challenging. 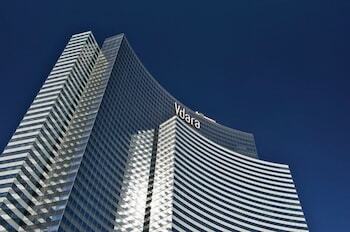 Here are our picks for the Top Ten Best Vegas Buffets. 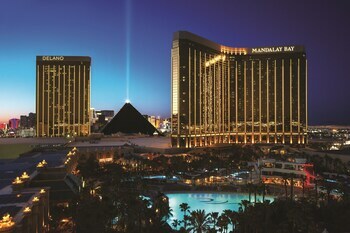 In addition, further down you will also find a summary of all the major Las Vegas buffets and what they have to offer. Bally’s offers their exquisite brunch at BLT Steak, which is located in the hotel. It is only offered on Sunday from 9:30 am to 2:30 pm. 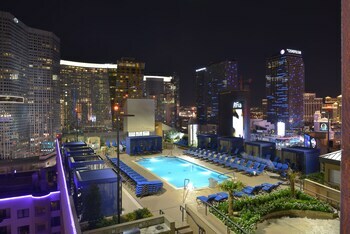 At $90 per person, it is not cheap, but it is definitely worth the price for what you get. It is highly suggested that you make reservations in advance. This buffet offers everything from the typical waffles and omelets to more exotic fare such as ostrich tenderloin and Maine lobster. This buffet-style brunch is so full of bounty and variety that is impossible to go hungry (or thirsty for that matter.) Unlimited Perrier Jouët champagne is served at brunch, with orange juice if you prefer to have a Mimosa, or you can choose a Virgin or Dirty Bloody Mary. The minute you are seated you are served warm Gruyére popovers. The appetizers are heavenly, but save room for the other amazing items that are waiting for you. At the steam and hot food tables you will find plenty of Maine lobsters and lobster tails (you can even sprinkle some caviar on them along with the butter sauce for a real decadent treat), roasted crab legs, stone crab, truffles, tons of oysters, giant gulf shrimp cocktails, several types of caviar, beef tenderloin, rack of lamb, truffle mashed potatoes, filet mignon, excellent prime rib, sushi and much more. Other highlights include a wonderful smoked Nova lox and a sampling authentic French charcuterie that includes delicious cheeses and cured meats. Bally’s brunch buffet also offers you a great selection of dessert items, such banana bread pudding, French toast, chocolate truffles with peanut butter, as well as assorted cakes and pastries. You can also order special items directly from your server, such as lobster bisque soup, Caesar salad, lobster eggs Benedict and other specialties. This place is truly a food-lover’s paradise. The waiters are even dressed in tuxedos with white gloves. It’s a fancy event with linen and fine silverware. 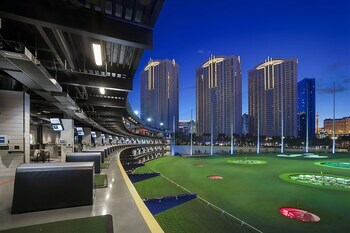 The environment is calm and relaxing, which also sets it apart from other buffets in Vegas. While the variety of food isn’t as massive as at regular buffets, the quality is much higher in terms of both content and execution which more than makes up for things. 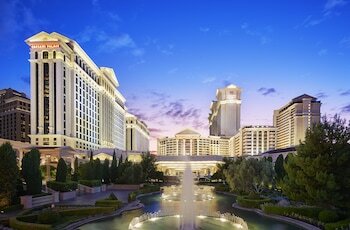 Located in Caesars Palace, Bacchanal is an an over-the-top feast created by a team of master chefs, offering diners the most variety of gourmet dining options on the Las Vegas Strip. 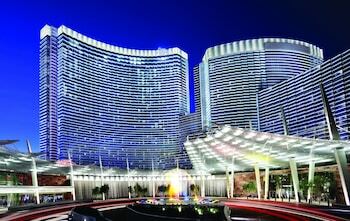 The restaurant costs over $100 million dollars to build and set a new bar when it comes to Vegas buffets. Bacchanal’s lofty goal was always to take the traditional Vegas buffet experience to the next level and it succeeds, garnering consistent five star reviews for being the best buffet in Vegas. Bacchanal prides itself on presentation and serves many of their food items on small plates with a presentation you might only expect to find at a fine dining restaurant. 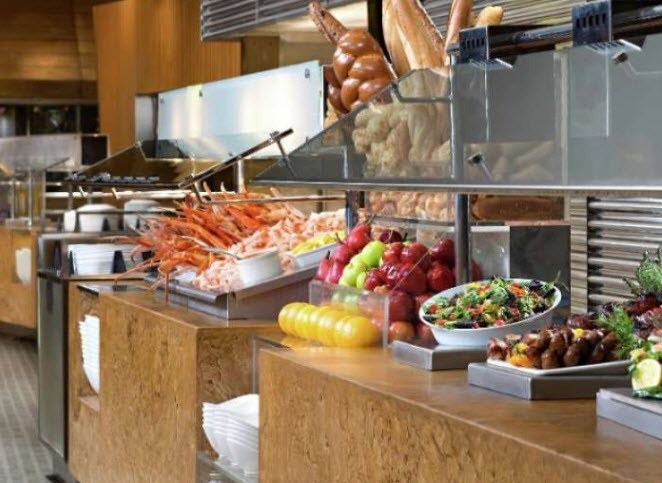 The Buffet features more than 500 items that include classic international favorites, such as made-to-order omelets, fresh seafood, and roasted meats like prime rib. Regional comfort foods on the menu include breakfast pizzas, red velvet pancakes, wood-fired Neapolitan pizzas, Chinese dim sum, and even roasted Southern Carolina shrimp and grits. A unique aspect of this buffet is that the majority of cooking is done in front of you by interactive chefs. You will not be let down by the sheer spectacle offered by this fantastic buffet. In addition to the extravagant daily offerings, Bacchanal offers around 15 different specials each day that are based on what is in season with well-thought out culinary choices made by their wonderful chefs. Food is served on small plates, which keeps the dining experience fresh and intimate, and less like eating from food troughs, as is common at a more traditional buffet. You will find ridiculously good sliders. Be sure to sample the very fresh king crab and snow crab legs (upon request, they will steam a plate for you). They even provide pre-cracked stand-alone crab claws, which is a rarity in any town. Bacchanal has excellent prime rib, beef brisket, and dim sum. The Chinese roast duck and dumplings that squirt savory soup when you bite into them are highly recommended. The lobster and corn chowder is also a winner as is their Mexican pork carnitas. You can also gnaw on great lamb chops and slurp up the noodles of awesome Ramen and Pho. Other highlights include wonderful ceviche, lamb shank and crab fritters. Although known for it’s exotic, international and exotic fare, Bacchanal also cooks simple dishes to perfection. 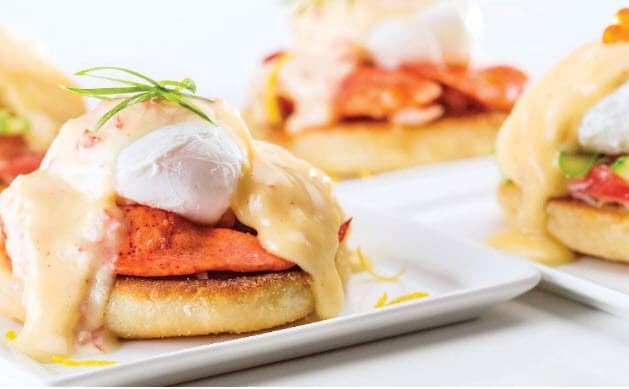 Favorites include Eggs Benedict (sold with either ham or smoked salmon), with poached eggs cooked to perfection and served with delicious bacon. Be sure to save lots of room for dessert if you can! The restaurant boasts a gelato and crepe station, which are two dessert options that go very well with each other. Other dessert highlights include green tea and red bean cookies, macaroons, mousse cakes, crème brûlée, cheesecake, and tiramisu. Insider Tip: With 500+ items available on the buffet tables, you won’t have time to sample them all at one meal, so if you can manage it, consider going for a late lunch and staying until dinner items become available. The array of foods offered at The Buffet located in Bellagio is fabulous, offering one ethnic cuisine after another. You will find Japanese and Chinese that includes unexpected buffet fare like dim sum, build-it-yourself Mexican food, and much more. There are elaborate pastas and semi-traditional Italian-style pizza served up piping hot from a wood-fired oven. The cold fish appetizers at each end of the line are not to be missed. Be sure to sample the scallops, smoked salmon, crab claws, shrimp, oysters, and assorted condiments. Other specialties include breast of duck and game hens. There is no carving station, but many meats are available pre-carved. Be sure to try the tasty prime rib with horseradish sauce. The Lyonnaise potatoes are also wonderful. While the salad bar is ordinary, there are some fine surprises in the selection of prepared salads, such as the eggplant-tofu salad and an exceptional Chinese chicken salad. 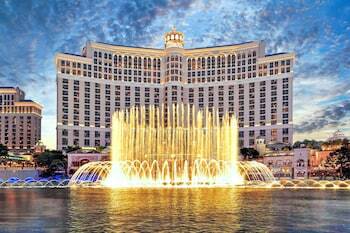 The Bellagio offers a “gourmet buffet” every Friday and Saturday night that includes Kobe beef, Beef Wellington, lamb chops, venison and buffalo. Especially good is the daily soup and bread combo. The lamb and king crab legs (sliced open length-wise for your convenience) are a definite must, as is the shrimp cocktail (not the tiny shrimp, but the jumbo-sized ones.). Breakfast/brunch is very good too with an offering of seafood omelets, lox and bagels, and perfectly cooked Eggs Benedict in a rich Hollandaise sauce. 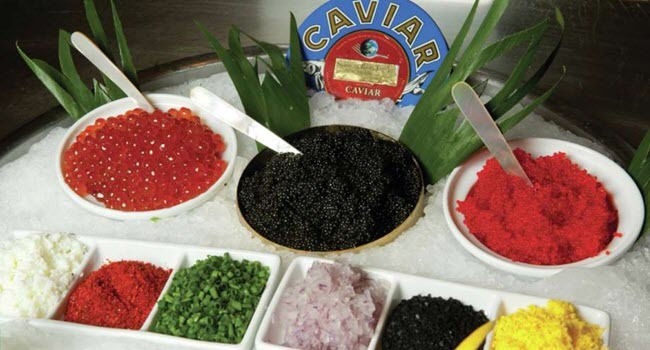 Chefs also serve some of the finest caviar that includes Ikura and Tobiko during their Gourmet dinner service. The caviar is served on house-made blinis or miniature buckwheat waffles, or it can be part of freshly made sushi and Ahi tuna cones. Traditional toppings include chopped eggs, onions and crème fraîche. The dessert selection is impressive, but did not stand out for us. However, it is definitely worth trying. You will find all your favorites, like tiramisu, mango mousse, bananas foster, flan, key lime pie, crème brulee, and many other items. They also have sugar free desserts. You can also upgrade your buffet to include unlimited drinks that include Margaritas, Bloody Mary’s, sparkling wine or beer. 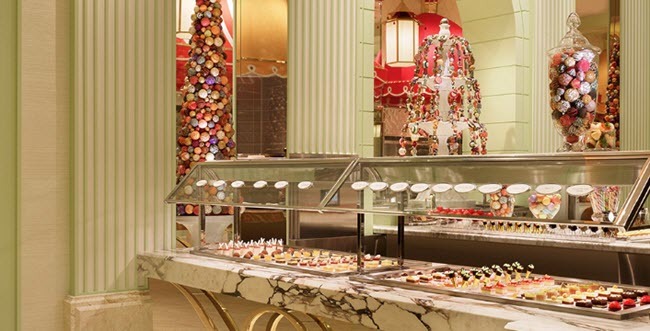 The Buffet Wynn Las Vegas is one of our top buffet picks. The fact that Mr. Wynn expects nothing but the best from his namesake hotel is most certainly proved by the quality and taste that this is delivered by this buffet. 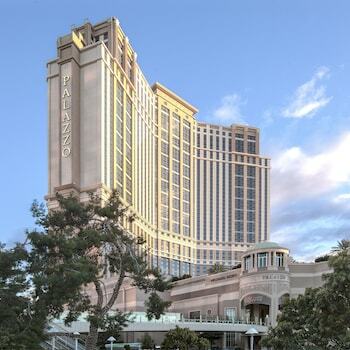 Wynn recently updated their buffet offerings to include over 120 new items, including individually plated items and an extensive selection of ethnic foods. The atmosphere is artistic and scenic, with colorful fresh flowers that match the decor of the hotel, and the service is 5-star. The seating of patrons is spread out to give a more civilized, warm feel to the buffet. Everything at this buffet is so delicious that it is hard to know where to begin, but let’s start with the crab legs. Amazing is the only way to describe them and going just to eat them and nothing else is well worth the price of admission. The crab station is setup so that chefs are constantly provided fresh ones, so you don’t need to worry about ever getting picked-over crab. However, be sure to go during dinner service, since you won’t find them during lunch. The Buffet at Wynn Las Vegas serves excellent prime rib. The Chinese dumplings were very good for a buffet. They also serve great sushi and salad, including a delicious Caesar salad. You will find many kinds of homemade pastas, including pumpkin ravioli and gnocchi in brown butter sauce, and wonderful lobster ravioli that is stuffed with nice sized chunks of lobster meat. Be sure to sample the awesome Peking duck buns, beer-battered fish and chips, and their “Sinatra” meatballs. The wonderful curry dishes, such as the chicken curry and chick peas are also worth trying. Other dishes of special note include scallops in a coconut milk ceviche, lamb chops (perfectly done), jerk chicken, and excellent soups made with real stock. There is also gazpacho, amazing pizzas and great Mexican food. 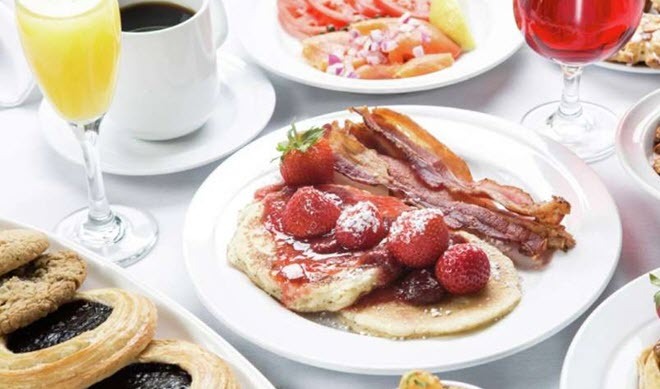 Even their breakfast is a real special treat, offering such delectables as apple wood smoked bacon, chicken and apple sausages, cheese blintzes, smoked salmon, and hash browns cooked to perfection. On weekends the buffet goes “gourmet” and features more exotic items, such as an entire roasted pig. We enjoyed the Thai beef, beef brisket, and crepes made-to-order. Also recommended are the very crispy fried chicken made with a secret ingredient – matzo meal. Notable, for a Vegas buffet, were the multiple vegan options that even meat-eaters thoroughly enjoyed. 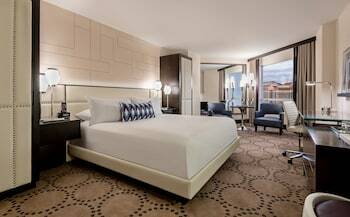 If you like drinking, for a flat fee upgrade on your bill, you will be provided with unlimited adult beverages, which for Vegas is a really good deal. You are going to have control yourself if you are going to make room for dessert. While not the star of the show, they were very good and included wonderful creme brulee, hot brownies, assorted tarts (pumpkin was our favorite), a crepe and waffle station, cookies, cakes, tiramisu, and an excellent selection of ice cream. Coffee is offered before dessert, which is a nice touch. A unique new item is their “ice cream roulette wheel” that holds a huge assortment of flavors that are all controlled by a motor that helps the server automatically get your choices to you. If you like nuts on your ice cream you are out of luck, since the entire buffet is nut-free. However, this buffet is great for those with nut allergies, which Wynn takes very seriously and has made this unique feature a focus for the hotel. However, if you are allergic to nuts or have a family member who is, be sure to ask first if this is a concern, since policies can change in the hospitality industry. The Village Buffet at Paris Las Vegas is one of the more ambitious buffets with a fine assortment of food, and more value for the dollar than you are likely to find anywhere else. 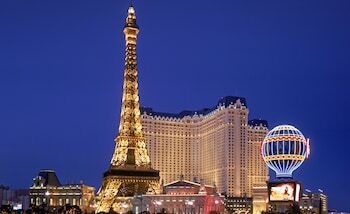 Plus, the Paris buffet is housed in a very pleasing venue that really adds to the enjoyment. It’s a Disneyland-esque two-thirds tall replica of a classic French village complete with architectural clichés. 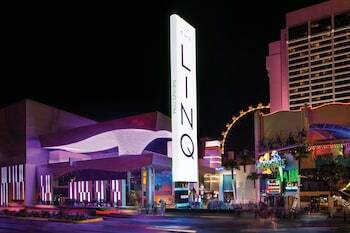 You will find the kitschiness of the place to be either charming respite from Vegas lights or sickening, depending on your tolerance level for such things. Buffet stations are grouped according to French regions, and even though in theory entrees change daily, there do seem to be some constants, including most of the dishes described here. In the Brittany area, you’ll find things like made-to-order crepes, surprisingly good roasted duck with green peppercorn and peaches, and steamed mussels with butter and shallots. In the Normandy area, there’s quiche and some dry bay scallops with honey cider. The carving station is set up in the Burgundy section, but distinguishes itself by adding options of chateaubriand sauce and cherry sauce Escoffier. Lamb stew is a possibility for Alsace, while Provence has pasta to order and a solidly good braised beef. You can skip the dessert station in favor of heading back to Brittany for some made-to-order crepes, but you might want to try the Bananas Foster, first. If you are still hungry in the morning, keep in mind that they also have a wonderful breakfast buffet. Everything about Cosmopolitan is different, including their buffet. The atmosphere at The Wicked Spoon Buffet is modern, chic, and sophisticated. It has one of the nicest decors you will find. Food is served in individual small portions on plates, but you can take as many plates as you like and create your own multi-course meal. You will find many nicely prepared dishes such as sweet potato fries, gyros, great lamb ribs, dim sum (try the pork belly steamed buns), Korean beef, very tasty mini chicken pot pies, Steak with chimichurri sauce (very tender), excellent short ribs tossed with pasta, crab legs, fantastic gnocchi, Kalbi beef, fried shrimp balls, risotto, sushi, huevos rancheros, and French toast stuffed with cinnamon apples and walnuts. A hard-to-find popular item they have is unlimited bone marrow served with a fig glaze. The deserts includes chocolate covered strawberries, apples dipped in chocolate, crepes, gelato, and fudge. If you have a large group of 13 or more, the Wicked Spoon will allow you to make reservations online, which is nice and avoids having to wait in a long line. Upgraded drink packages that include mimosas, champagne, Bloody Marys, house red/white wines, and draft beer are also available and can be a very good value. They are valid for up to 2 hours after purchase. The buffet at Aria Las Vegas features steamed fresh crab legs (cold are also available, but we liked the hot ones best), jumbo shrimp cocktails, rack of lamb, mussels in garlic wine sauce, very tender prime rib, made-to-order pastas and omelets, sushi, pizza, prime meats grilled and carved (including NY Strip) to your specifications and oysters on the half shell (gourmet nights). Delicious kabobs, BBQ, freshly-baked naan (garlic naan was delicious) and other savory dishes are prepared in the only Tandoori Oven in a Las Vegas buffet. Their soups are all made from scratch and excellent. You can also find rice congee and add preserved eggs and bbq pork to it. In addition to a salad bar, you can also make your own baked potatoes with lots of different toppings. The carving station stood out for us and they have a wonderful hot BBQ sauce that goes with just about anything. Their steamed crab, muscle bake is great too. 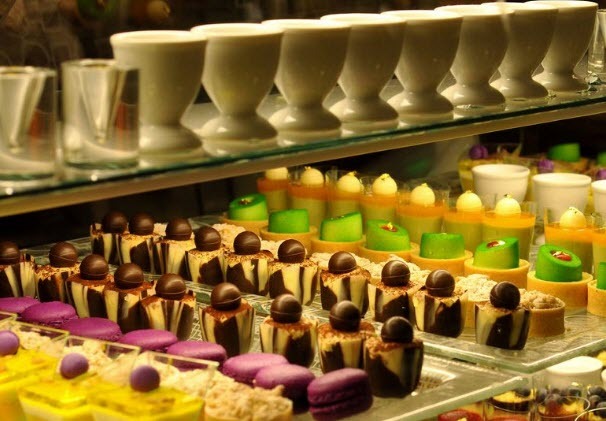 They have a wonderful dessert selection with gourmet pastries, cookies, flan, dulce leche, creme brulee and ice cream. Instead of regular soft serve ice cream, they have a large assortment of creamy Italian gelato. They also have a nice selection of cheesecakes, shortcakes, cream puffs and extra fancy “shooters” such as red velvet, carrot cake, coconut tapioca, Oreo pudding, tiramisu and more. Many of their desserts are presented in a way that you would only expect to find when ordering from a fine dining restaurant. 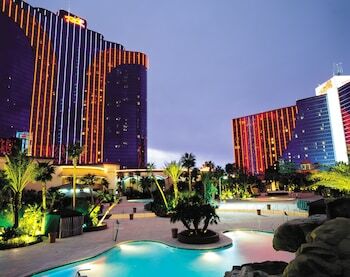 Rio Las Vegas merged the Carnival World buffet with their Village Seafood buffet to create a great single venue that offers solid buffet items with seafood specialties complete with American, Mexican, Italian, and Chinese serving stations. At the American station you can load up on seafood salads, snow-crab legs, oysters on the half shell, peel-and-eat shrimp, seafood gumbo, grilled salmon, broiled swordfish, oysters Rockefeller, poached roughy, steamed clams, sushi and lobster tails. There are also ethnic ocean entrees, such as seafood fajitas, cioppino, seafood cannelloni, squid chow fun, and kung pao scallops. You will find over 300 items. 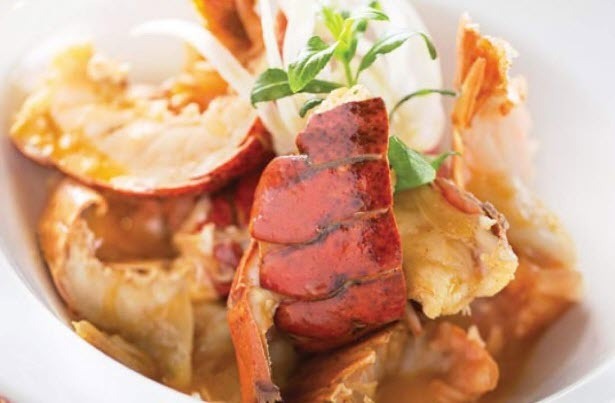 However, the special 70+ seafood entries, like lobster, require an upgrade to the basic price, but it is definitely worth it in our opinion if you are a seafood fan. The desserts stood out and you can taste the care their chefs put into making them. You will find things like homemade pies, cakes and pastries, and nine gelato flavors. Nothing says Vegas excess like endless mounds of shrimp and prime rib heaped up on huge platters. 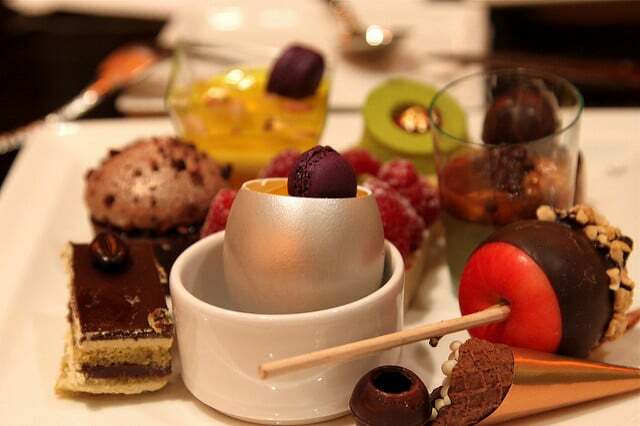 The Cravings Buffet at the Mirage is one of the most reliable in terms of food quality. The carving station is complimented by a fajita station, an Asian station, and a pasta station. The pasta station features made-to-order sauces, starting with either a cream or tomato base. 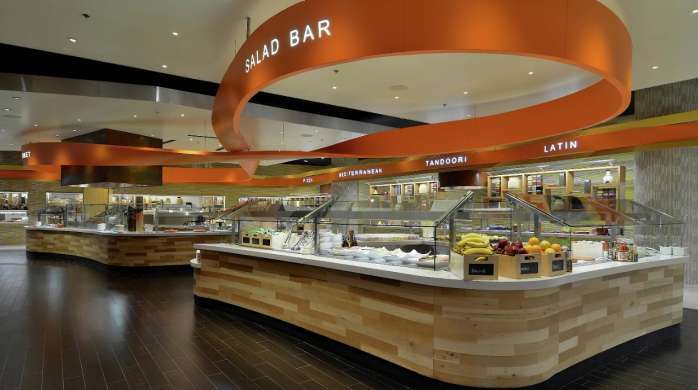 The salad bar features surprises like hummus, baba ghanoush, and couscous, plus a variety of veggie-intensive dishes. There is even gefilte fish (a Jewish staple), which is not something commonly seen on a Vegas buffet. The peeled shrimp is very fresh. You will also find crab legs and crab claws. Another highlight is a noodle section that serves great wonton and Pho soups. Desserts are good and include bread pudding, chewy peanut-butter cookies, and an unexpectedly intense chocolate mousse. The Bayside The The Bayside Buffet at Mandalay Bay serves prime rib, crab, pizza and much more that includes a salad bar, carving station, ethnic food table, pasta station seafood station, Asian station, and Mexican station. Combined with sweeping views of the 11-acre tropical lagoon outside the hotel, this buffet features live action stations and delightful culinary cuisine. 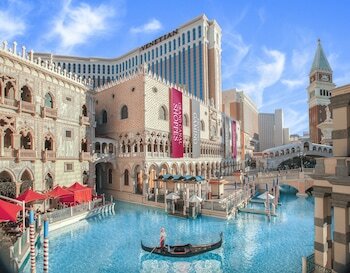 Bayside offers one of the most attractive buffet areas in Las Vegas. The south end of the buffet features richly polished wood floors and a nice view overlooking the resort’s tropical water garden. Items we liked included a great eggs Benedict, hot and cold snow crab legs, chilled peel & eat shrimp, lox, Osso Bucco lamb. seafood paella, smoked trout, assorted cheeses and cold cuts, and fresh cut fruit. Their pizzas, which included one with lox and cream cheese, where very good. The dessert area is separated from the primary serving area and features a modest variety of soft-serve ice creams that were much better than your typical buffet soft-serve and came with many toppings. You will also find pies, cakes, tarts and cobblers. The dessert table hand many sugar-free desserts, including chocolate cream pie, carrot cake, German chocolate cake, and lemon meringue pie. You cannot go wrong with picking any of our top 10 best buffets listed above, but Vegas and the surrounding area, has many more great buffets. 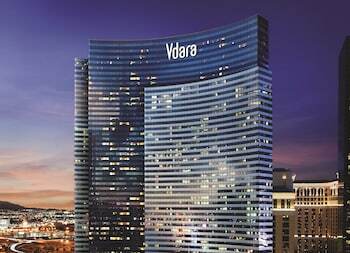 The list below covers most of the major hotel buffets around Las Vegas Strip. 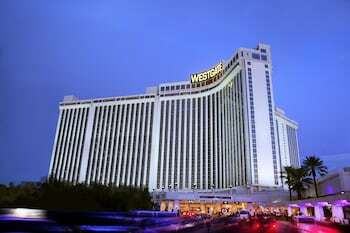 We also list more awesome buffets located off the strip and outside of Vegas. If you know of any other good ones we missed, or notice some incorrect information, please let us know in the comments. Features limitless mountains of fresh crab legs, made-to-order pastas and omelets, sushi, pizza, and prime meats grilled and carved to your specifications. Delicious kabobs, freshly-baked naan and other savory dishes are prepared in the only Tandoori Oven in a Las Vegas buffet. Excellent dessert selections offer gourmet pastries and ice cream. The Buffet at Bellagio offers one of the most varied buffets in Vegas. 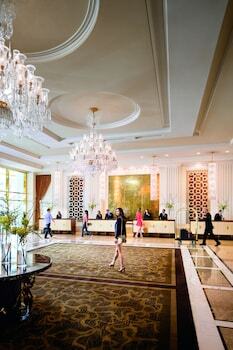 Guests may choose from the best of Italian, Japanese, Chinese, seafood and American cuisines, offered daily. The place is also well known for it’s deluxe gelatos and French pastries. The Bacchanal is an an over-the-top feast created by a team of interactive master chefs, offering the most variety on the Las Vegas Strip. 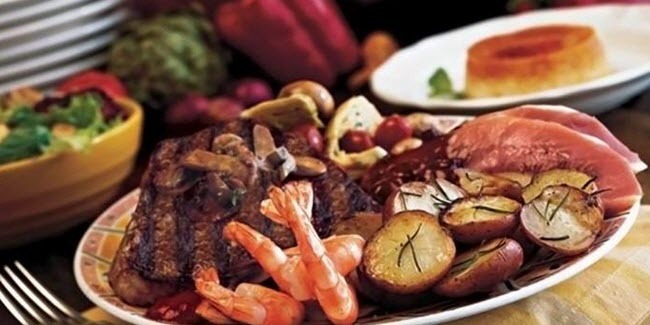 Bacchanal Buffet features more than 500 classic dishes such as made-to-order omelets, fresh seafood and prime rib to cutting edge as well as regional comfort food like breakfast pizzas, red velvet pancakes, Chinese dim sum and roasted South Carolina shrimp and grits. Circus Circus Buffet offers All-Day buffet pass for q $25.99 flat rate. Buffet favorites include a salad bar, carving station, hot stations with stews and meaty entrees, fried shrimp and desserts. Everything about Cosmopolitan is different, including their Wicked Spoon buffet. The atmosphere of the Wicked Spoon is modern, chic, and sophisticated. Nicely prepared dishes including gyros, great lamb ribs, dim sum short ribs tossed with pasta, risotto, sushi, Huevos Rancheros, and French toast stuffed with cinnamon apples and walnuts. The Excalibur Buffet strikes the perfect balance of cheap prices, forgettable decor, and adequate food. It’s what you want in a cheap Vegas buffet. The plates are large, so you don’t have to make as many trips to the buffet tables. Buffet is a low cost buffet and still gives you the shrimp and prime rib that the more expensive ones do. The Paradise Buffet at the Flamingo has an amazing salad and fresh fruit bar that features mounds of shrimp on ice, Snow Crab Legs at dinner and Assorted International salads and sushi. It also serves prime rib, turkey, roasted leg of Spring lamb, Glazed duc, Double Breaded Southern Fried Chicken and a Catch of the day. There are also over 60 breakfast items including Omelets, made-to-order Malted Waffles, and breakfast Pastries. 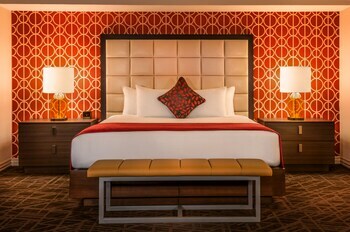 This Las Vegas main-stay offers indoor and outdoor seating. 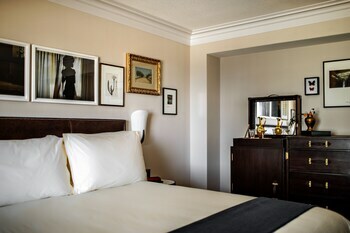 It has that beautiful view and boasts a the classy and clean environment that you would expect from the Four Seasons Hotel franchise. The buffet has a smaller selection of foods than other places in Las Vegas, but offers very high quality and sometimes gourmet items, such as their signature omelets with crab and lobster meat. There are also fresh fruits, lox and bagels. A visit to the donut station is a must at this popular, high-quality establishment. Flavors, The Buffet represents cuisines from around the world, including Churrasco, or Authentic Brazilian BBQ, pizzas and Italian casseroles prepared in a wood burning oven, fire-roasted rotisserie chicken, piping hot steamed crab legs and tasty Asian selections such es. 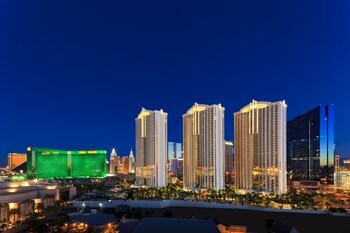 Flavors is one of the most diverse buffets on the Las Vegas Strip. For dessert, Flavors features a gelato station with homemade sorbet and a breakfast buffet with bacon, biscuits and gravy and made to order omelettes. The Buffet at Luxor is known for its eccentric Eygptian decor, 30-foot salad bar, homemade pizza station, two carving stations, omelet station, and specialties from around the world. 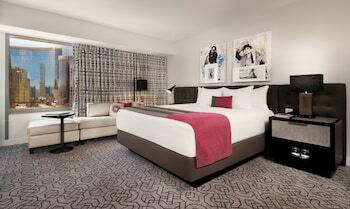 Studio B is a locals’ favorite: It is about 20 minutes south of the Strip in Henderson, but worth the drive. 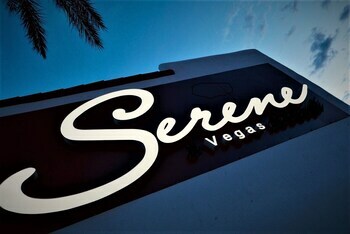 The Las Vegas Review Journal voted them as being a best buffet. The all-you-can-drink wine and beer and espresso drinks with shots of liqueur included in the price are a unique feature. Featured dishes include chimichurri shrimp, green curry chicken, BBQ ribs, a prime rib, crab legs, and New York strip. With over 200 menu items, there is something for everyone. Be sure to save room for their excellent cheesecake, creme brulee, gelato or mousse. For what you get, it is an excellent value. The MGM Grand Buffet includes crab legs, oven-roasted turkey and prime rib, sea bass in yellow curry sauce, diablo seafood stew, pasta, pizza, and an extensive dessert bar. The Bay Side Buffet offers Prime rib, crab, pizza, salad bar, carving station, hot seafood, ethnic food, pasta station and desserts. Combined with sweeping views of the 11-acre tropical lagoon, It is also unique for offering sugar-free desserts, including chocolate cream pie, carrot cake, German chocolate cake, and lemon meringue pie. 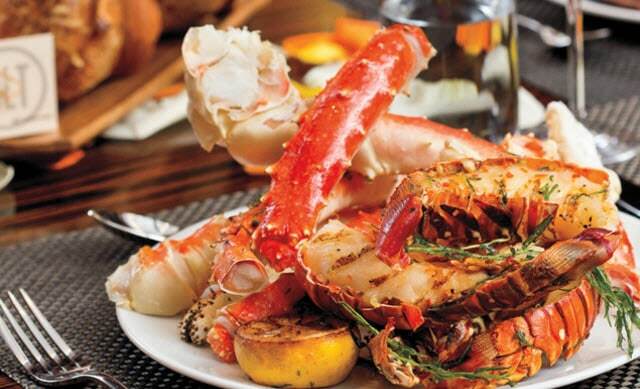 The Cravings Buffet at The Mirage Features crab legs with drawn butter, prime rib, meat carving station, pizza, pasta, sushi, Mexican food, Chinese dishes, grilled orange roughy, mussels and cioppino, Mediterranean, American, and Italian items and gelato desserts. The Buffet at Monte Carlo features a large salad bar, a fresh-made pasta bar, grill stations and carving stations serving excellent prime rib, crab legs (weekends), Asian, pizza, Mexican, seafood, sushi, and roast beef wrapped in bacon. Lunch buffet has a build your own Philly sandwich station. The Bistro Buffet at The Palms has great warm crab legs, Lebanese-style chicken, tabbouleh, hummus and babaghanoush, slow-roasted prime rib, made-to-order English Trifle and Free beer, wine, and sodas. Dessert highlights include bread pudding and cheesecake. Le Village Buffet at the Paris offers dishes from the five provinces of France, including crab legs, prime rib, duck, roast beef, steamed fish, ratatouille, different cheeses, pate, smoked salmon and bagel. There is a great dessert selection including creme brulee, flan, various cakes, banana foster, ice cream and cookies. The Spice Market Cafe at the Planet Hollywood Resort and Casino includes Mexican, Italian, Asian, Middle Eastern and American. Seafood station. Lamb, Hummus, baklava. Dessert selection includes cotton candy. The Garden Fresh Buffet has on of the most affordable champagne buffets in Las Vegas. Four themed food stations include Mexican, Italian, Chinese and American. Beef ribs, Mac ‘n cheese, grilled Italian seasoned chicken, chicken patty with tomato sauce, Mexican rice, roast beef, fried chicken, bacon and sausage, egg station. Dessert selections include sugar free items. The Courtyard Buffet at Stratosphere serves global cuisine, including Pan-Asian, Southwestern, American comfort foods, regional European flavors, carving station, deli display, omelet bar, freshly baked pastries, prime rib, brisket of beef, roast chicken, roast turkey. Seafood nights include shrimp, oysters, and crab legs. Tbe Emperor’s Buffet in The LINQ is an economical buffet featuring a good breakfast selection, fried chicken, prime rib and crab. 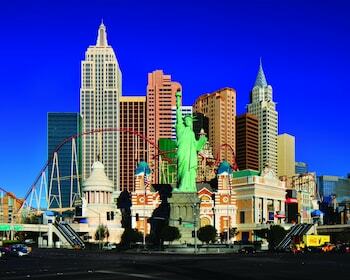 It is good for traveller’s on a budget who are not necessarily in Las Vegas to sample gourmet food. The Buffet at Wynn includes king crab legs and crab claws, prime ribs, lamb chops, curry dishes, cerviche, sushi, smoked salmon, prawns, gnocchi, freshly made soups, applewood smoked bacon, chicken and apple sausage and short ribs. Arizona Charlie’s Dacatur Frisco Market Cafe serves dishes that hail from San Francisco including pasta, steaks, seafood and salad. The Boulder Station Feast buffet offers travellers on a a budget a way to enjoy a complete feast. The Cannery serves the Cannery Row Buffet, which features an eclectic array off food, a champagne brunch and special prime rib nights. 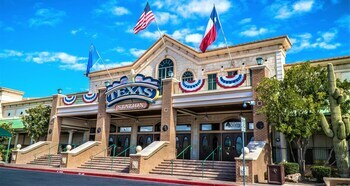 The Festival Buffet in the Fiesta Henderson offers very a selection of very inexpensive global cuisines, six food stations and a massive dessert bar. The Festival Buffet in the Fiesta Rancho offers six cooking statons, a variety of inexpensive global cuisines and a dessert bar. 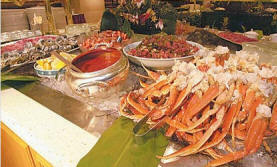 The Paradise Buffet offers an all-you-can eat buffet with several options in a tropical garden setting. The Ports O’ Call Buffet offers 7 live cooking stations featuring local cuisine and also cuisines from around the world including Chinese, Mexican and Italian. The Buffet at the Golden Nugget includes BBQ beef, shrimp cocktail, fried shrimp, hush puppies, Chinese food, prime rib, pia and crab salad. Crab legs and oysters are available at the seafood buffet. There is a also an extensive selection of desserts. 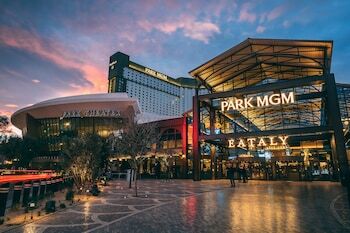 The Feast Buffet at Green Valley Ranch features six live-action cooking stations serving Italian, American, Mongolian, Chinese and International specialties prepared right before your eyes. A wide selection of low-carb menu items is also available. They also have excellent pizza, brisket and chicken fried steak and a gelato and dessert bar. The Garden Court Buffet Voted as one of best buffet in Downtown Las Vegas. Choices including Mexican food, Southwestern fare, Asian delights, pizza and rotisserie chicken. Other items of note include country fried steak and excellent prime rib brisket, very moist chicken, and a Hawaiian section, which has Kailua pork and oxtail stew. The French Market Buffet at Orleans Casino serves Prime Rib, Shrimp Scampi. crawfish, beef ribs, shrimp fried rice and tacos. Different stations serve American, Mongolian, Chinese, Mexican, Italian and BBQed foods. The Feast Gourmet Buffet features a made-to-order pasta, steak, and hamburger station. It is known for serving good fried chicken and roast beef. Breakfast is big and includes bacon, sausage, eggs, and pancakes. The Feast Buffet features sushi, faitas and a variety of different international dishes. The Firelight Buffet serves a variety of cuisines, including American, Asian and Mexican in a comfortable setting. The Seasons Buffet is now for it’s all-you-can-eat buffet, champagne brunch and dishes from all around the world in a comfortable contemporary space. The St. Tropez Buffet at the SunCoast Hotel & Casino International Buffet is known for it braised beef, mashed potatoes and salad bar. The Feast Around the World Buffet is known for it’s hot tables and carving station with roast beef, fresh biscuits and affordable brunch, which includes a big breakfast with suasages and hash browns. Terrible’s Buffet has over 200 items to choose from including lobster tails, caviar, king crab legs, a lobster benedict, a dessert table and a champagne brunch option. The Feast Around The World Buffet offers a large variety of items for all tastes. There is a Latin station with a made to order fajita station and specialty chilies and salsa bar. The BBQ station features hickory smoked pulled pork, with all the fixins’. The Mesa Buffet at the Casablanca Resort, Casion and Golf Spa offers an affordable brunch served with Mmosas, seafood dinners, New York Steak and crab legs. 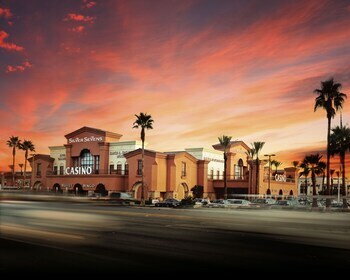 The Eureka Casino Resort Buffet serves American, Mexican, BBQ, Italian, Mediterranean, Greek, Southern, Cajun, Asian and Seafood Cuisines and much, more. The buffet is accompanied by an elaborate dessert station with homemade donuts, crepes, and confections. The Paradise Garden Buffet serves up breakfast, American and global flavors and is known for it’s exceptional view of a wildlife habitat. 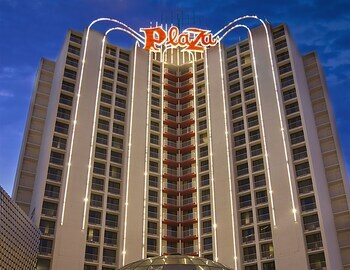 The Bonanza Buffet is known for its crab leg dinner buffet, steamed lobster and offerings of pizza, sandwiches, jalapeno poppers, ice cream and Danishes. The Green’s Buffet features an affordable array of dishes from all over the world. The Box Car Buffet serves up a variety of dishes from all over the world as well as shrimp and steak dinners. The Silver Spur Buffet s known for its array of traditional American favorites and makes the best cheeseburger in Pahrump. 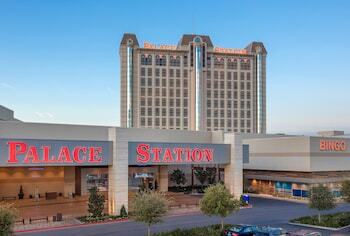 Sierra’s Buffet features an extensive selection of all-American dishes and a spacious, elegant atmosphere. The Wagon Wheel Buffet features a large array of affordable American favorites including, chicken,steak, hamburgers, hot dogs, soups and salads as well as cakes, cookies and pies for dessert. 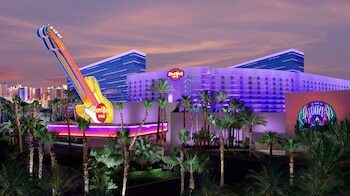 What Should A Visitor Do If Injured While Visiting Las Vegas? 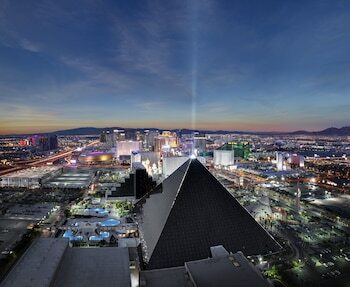 Las Vegas Craps. How to Play and Win!